Twelve-year-old Meggie learns that her father, who repairs and binds books for a living, can "read" fictional characters to life when one of those characters abducts them and tries to force him into service. An ALA Notable Book. Reissue. Some books are destined to be lifelong treasured possessions. Inkheart by Cornelia Funke, the bestselling German author of The Thief Lord, could easily lay claim to being such a book. It is a meaty, magical adventure that oozes a passion for books and the awesome power of words on a page, written by an author who clearly adores stories. Every chapter is introduced by tempting quotations from classic novels that whet your appetite for more and help underline the terrific heritage of children's literature that Inkheart is added to. Meggie is the daughter of a revered bookbinder called Mo whose peaceful existence is one night shattered by the arrival of Dustfinger--a shadowy man with a mysterious link to Mo's past. Mo and Meggie are soon on the move, running from something that threatens everything they hold dear. But the past inevitably catches up with them and Mo is forced to reveal to his daughter for the first time his terrible secret. He has the ability, or curse, to breathe life into any story he reads and make the characters come alive. Just such a character, the sinister Capricorn, is after Mo to ensure that he stays alive and is never returned to the pages from which he was sprung. And, of course, he'll stop at nothing to guarantee success. (Intermediate, Middle School) Who hasn't dreamed of it--characters leaping from the pages of a book to interact with the reader? Or, better yet, the reader transported--quite literally--into the make-believe world of a novel? In this tale of adventure and fantasy by the author of The Thief Lord (rev. 11/02), twelve-year-old Meggie and her father Mo live in a house overflowing with "small piles of books, tall piles of books, books thick and thin, books old and new." But it's one particular book that brings a stranger named Dustfinger to their house one rainy spring night. Meggie learns that many years earlier, while Mo was reading aloud a novel called Inkheart, his voice somehow brought many of its characters--including Dustfinger and the evil despot Capricorn--"slipping out of their story like a bookmark forgotten by some reader between the pages." 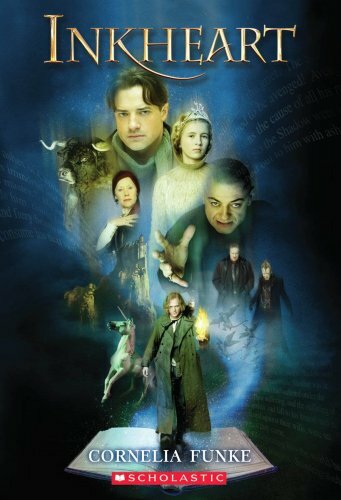 Now Dustfinger (who longs to return to his fictional origins) wants Mo to read him back into the book, while Capricorn (who likes it here just fine) wants Mo to use his powers to read gold and riches out of stories such as Treasure Island and summon a malevolent, immortal character called the Shadow from the pages of Inkheart. Thanks to Harry P., kids may not be scared off by this volume's heft, though they may wish the pacing wasn't quite so leisurely--even the novel's many chases and hostage-takings are related in a deliberate fashion. But bibliophiles will delight in a story that celebrates books (each chapter begins with a literary passage ranging from Shakespeare to Sendak), and the conclusion is especially satisfying. Copyright 2004 of The Horn Book, Inc. All rights reserved. (Intermediate, Middle School) Who hasn't dreamed of it--characters leaping from the pages of a book to interact with the reader? Or, better yet, the reader transported--quite literally--into the make-believe world of a novel? In this tale of adventure and fantasy by the author of The Thief Lord (rev. 11/02), twelve-year-old Meggie and her father Mo live in a house overflowing with -small piles of books, tall piles of books, books thick and thin, books old and new.- But it's one particular book that brings a stranger named Dustfinger to their house one rainy spring night. Meggie learns that many years earlier, while Mo was reading aloud a novel called Inkheart, his voice somehow brought many of its characters--including Dustfinger and the evil despot Capricorn---slipping out of their story like a bookmark forgotten by some reader between the pages.- Now Dustfinger (who longs to return to his fictional origins) wants Mo to read him back into the book, while Capricorn (who likes it here just fine) wants Mo to use his powers to read gold and riches out of stories such as Treasure Island and summon a malevolent, immortal character called the Shadow from the pages of Inkheart. Thanks to Harry P., kids may not be scared off by this volume's heft, though they may wish the pacing wasn't quite so leisurely--even the novel's many chases and hostage-takings are related in a deliberate fashion. But bibliophiles will delight in a story that celebrates books (each chapter begins with a literary passage ranging from Shakespeare to Sendak), and the conclusion is especially satisfying. Copyright 2004 of The Horn Book, Inc. All rights reserved.